Deutsche Lufthansa is headquartered in Cologne, Germany and is one of the largest airlines in the world. It has two primary hubs in Frankfurt and Munich airports, along with smaller regional hubs in Dusseldorf, Hamburg and Cologne. It is one of the core members of the Lufthansa Group, which includes subsidiaries SWISS International Airlines, Austrian Airlines, Germanwings and Brussels Airlines. Lufthansa operates a wide and narrowbody fleet comprised of both Boeing and Airbus aircraft. It is easier to describe each by combining the aircraft with the route pairings. Lufthansa’s Airbus A380 routes are to high-density markets with significant origin and destination volumes through its Frankfurt hub, either due to market size (New York, Miami Los Angeles, New Delhi, Tokyo, etc), Star Alliance or Joint Venture hub-to-hub routes (San Francisco, Houston, Singapore, Beijing, Seoul) or purely high-yielding business markets (Hong Kong). Lufthansa’s Boeing 747-8I routes are also sent to high-density, origin-and-destination heavy markets, Star Alliance hubs and major business markets, but generally, these are airports that are currently unable to accommodate the Airbus A380, such as Boston, or have less Economy class demand. Worth noting is that per seat guru, Lufthansa’s Airbus A380 and 747-8Is have roughly the same number of Premium Cabin seats (12 First, 78-80 Business) but the A380 has 20 more Premium Economy seats and over 100 additional Economy class seats. 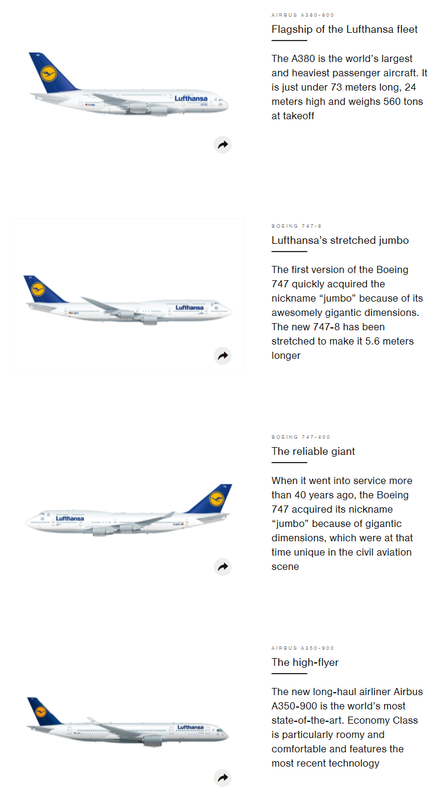 Lufthansa’s Boeing 747-400 classic routes are also sent to large origin-and-destination markets, Star Alliance hubs, and major business markets, but Lufthansa no longer offers First Class on its 747-400s. Instead, the cabin configurations either feature 67 or 53 Business Class seats, 32 Premium Economy seats, and 272-308 Economy Class seats. Lufthansa’s Airbus A350 routes are currently based out of Munich and are designed to be the replacement aircraft for its Airbus A340-600s and A340-300s. The vast majority of long-haul routes out of Munich are on Airbus A340s and Airbus A330-300s at the moment. Lufthansa’s Airbus A340-600 flies to Star Alliance hubs in the Americas and Asia, along with high-volume markets like Mexico City and Hong Kong. The carrier currently has 8 of the A346 in its fleet. Lufthansa’s Airbus A340-300 routes fly to spoke markets across its long-haul network. There are 29 of them in the fleet. Six of the A340-300s are operated by Lufthansa Cityline, which feature a high-density configured aircraft that are operated by CityLine pilots, but wet-leased back to Lufthansa. 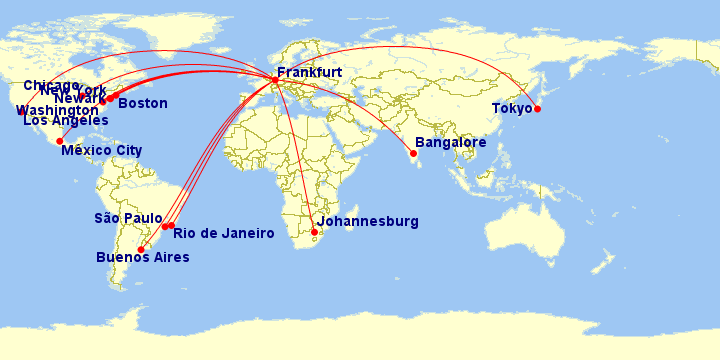 These are mostly leisure routes, but are served by Lufthansa cabin crews. Finally, Lufthansa operates the Airbus A330-300 from both its Frankfurt and Munich hubs to the above markets. Lufthansa operates the Airbus A320, Airbus A319, Boeing 737-500 and 737-300. Lufthansa is a strong regional carrier in Germany and Europe, but its vast intercontinental network is what makes it one of the largest airlines in the world. Lufthansa is very prominent in North America, but not as much in Latin America. It has perviously served Caracas and Santiago de Chile in prior years, among other markets. Lufthansa’s Asia network is powerful with joint venture agreements with All Nippon Airways, Air China and Singapore Airlines. It also has Star Alliance partnerships with carriers such as Air India, Thai, Asiana and EVA Air, among others. Lufthansa’s long-haul network from Munich. 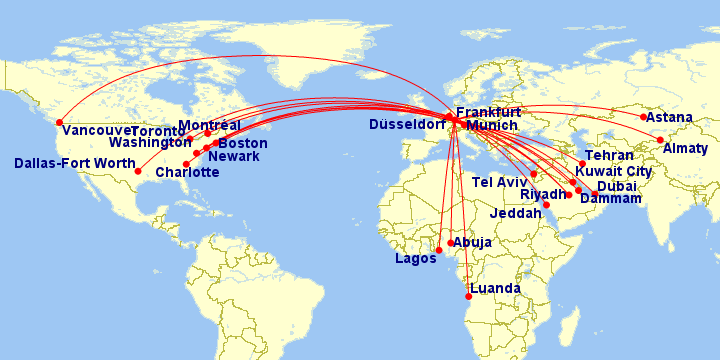 Equally impressive is Lufthansa’s long-haul network from Munich. There are actually a few routes that are served from Munich, but not Frankfurt, such as Charlotte and Montreal (although the latter is offered by CityLine). There is one long-haul route not offered from either Frankfurt or Munich, and that is from Dusseldorf to Newark. The Lufthansa Kiosk is a place for AvGeeks to purchase things like a poster of Lufthansa’s planes, order books on the 747-8I or even copies of the in-flight Magazin. A neat video about Lufthansa’s Integrated Operations Control Center (IOCC) at Building Two in Frankfurt Airport.